Luxury, relaxation, pampering. These thoughts and more may come to mind when you think of a jacuzzi. No. You wont' be wrong. But these days, jacuzzis come equipped with more features, many being pretty beneficial. Multiple jets are a feature in many corner jacuzzis. But in addition some come equipped with FM Radios, hydrotherapy packages, bluetooth and water heaters. In addition, there are whirlpool elements as well as a handy remote contol features. Yes, corner jacuzzis are so relaxing and refreshing, but with a whole lot more. Here is a synopsis of 5 of the best corner jacuzzis in the market. Take out all you aches and pains while you relax in your free standing acrylic corner jacuzzi. 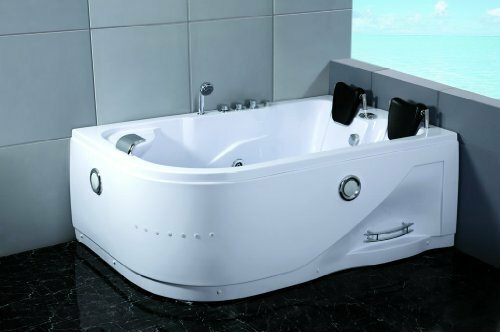 This 100 gallon tub has 6 hi output spa jets and 4 smaller jets that will surely give your body a luxurious body massage. Relax your senses as your eyes feast on the fiberglass reinforced white acrylic accentuated by high quality copper drain, faucet and jacuzzi jets. The acrylic is guaranteed to be stain- proof so that you won’t have to worry about your tub looking dirty. Run hot water through your extremities using the 4-foot long hose. Just enjoy your time being submerged in almost neck deep water and feel the heated water pressure roll through your muscles, reinvigorating them.The Empava Jacuzzi accessories are pre-drilled for easy installation. 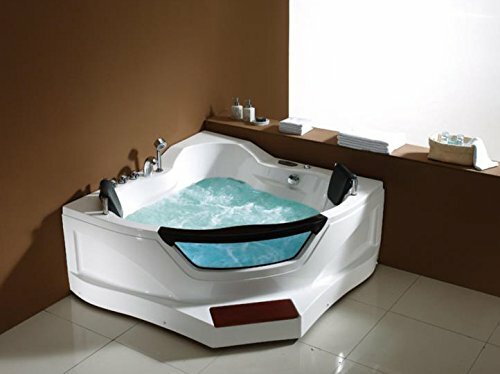 Product Dimensions: 59in (W) x 59 in (L) x 28in (H); the jacuzzi is powered by a 1HP motor and is computer controlled. Click here for more info and prices on Amazon. 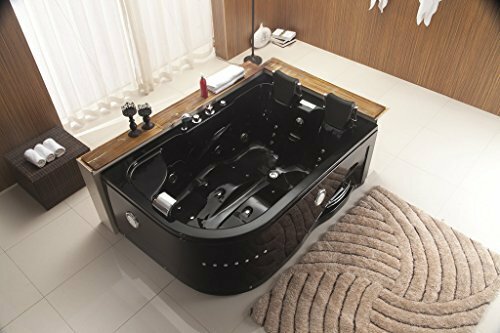 2- 2 Person Whirlpool Massage Hydrotherapy Black Corner Bathtub Tub (with FREE Remote Control, Water Heater, and Shower Wand). This elegant 2-seater bathtub from Whirlpool breathes class from its details: from the black lucite acrylic, to the multiple massage and air jets, and the waterfall faucet. While you relax your body, give your soul a lift as you listen to relaxing music provided by the built- in music system with headsets. Its thermostatic faucet with an Ozone water cleaner ensures that you are bathing in the cleanest waters; a built- in underwater LED light provides lighting at night. The bathtub comes with a water level sensor so that you would not have to worry about over-filling and leg levelers at the bottom of the tub to make sure that the tub stays firmly in place. Product dimensions: Bottom 36 in (l) 45 in (w); Top 41 in (l) 61.5 in (w) as the spa slopes inward towards the bottom. Height is 26 in. You have the option of having an expert set-up at a relatively minimal cost. This 2-person tub has all the amenities one can possibly as for in a modern jacuzzi: LED control panel with remote control, adjustable air bubble and water jets, and built-in dream pillows with back support. The tub also has a built-in ozone water cleaner, a shower wand and a waterfall faucet. The tub showcases a 63-inch front glass window mounted on a stainless-steel frame while the rest of the tub is made up of white lucite acrylic which is fiberglass reinforced. The tub is equipped with a water overflow drain, a sound system and color changing LED lights all of which guarantees pleasing of your senses to the hilt. Indulge in this luxury as you rest your head on the dream pillow that even provides back support. 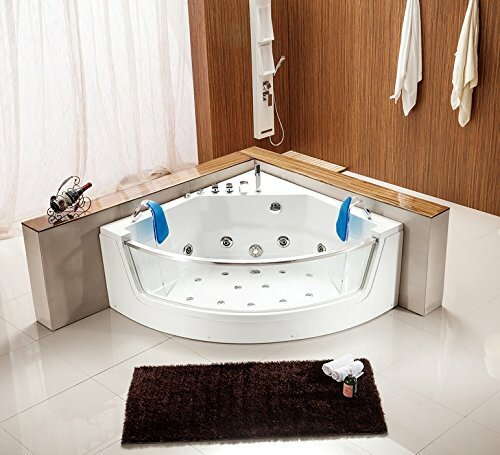 Relaxing is put to a higher level with this hydrotherapy tub from Whirlpool. Product Dimensions: 55.5” (L) x 58” (W) corner to corner (glass facing) x 24”(H) till top of acrylic. Note: Inline water heater is used to maintain water temperature but cannot heat cold water. This corner drop-in jacuzzi from whirlpool has a lot of room for two. 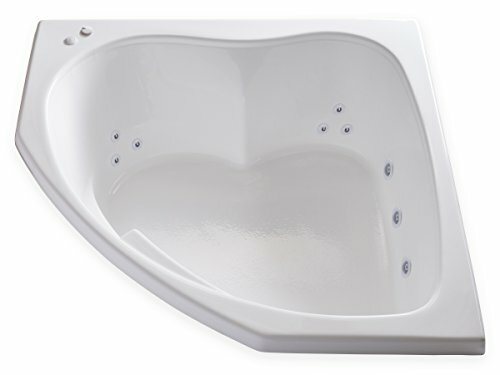 With only the armrest carved out of the inner tub, the users can stretch out in the 60” by 60” triangular tub and maximize the pressure and heat coming from the 2 AccuPro and 4 Therapro jets, respectively. The bottom of the top has a textured finish to prevent slipping. The jacuzzi comes with a true-level self leveling system so that it is supposed to be installed more easily (although it would be safer to really get the assistance of an expert installer as a few dollars could ensure accurate installation without the crevices and possible leaks). Product Dimensions: 60” (L) x 60” (W) x 22.5” (H). Sitting down the water could reach up to mid breast for a 6-ft. person. The tub is almond colored and the pump is located at the left side o the tub so it won’t disturb most right- handed people when using the tub alone. For a minimal fee, you can enjoy a worry-free installation which would include levelling and preparing the site for liner installation, actual installation of customer-supplied liner, plumbing reconnections and checking thereof, and disposal of old lining. Click here for more info and pricing on Amazon. 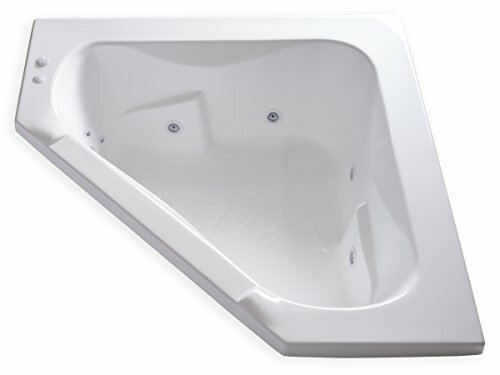 At 66.8” (L) x 66.8” (W), this is a wide 2-seater drop-in hot tub. It has an infinity overflow which enables maximization of the 24” deep water. The spillage over the edge is collected into a collection chamber so buyers of this tub need not worry about tub waste as a chrome drain and drainage system comes with the fixture. 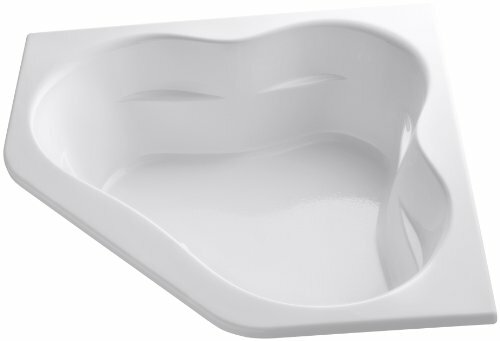 The tub has 2 ergonomically designed pillows for added comfort while relaxing in its upper breast water level. It is equipped with a multi-speed motor which can be operated at either low or high speeds at a simple tap with the built-in controls. For a sleeker look, you have the option to purchase the wood deck which is available in rich teak. exotic wedge or unfinished wood. This luxury spa is equipped with 15 jets and a chromatherapy heater that provides a luxury spa experience which can only come from the pioneer hot tub maker, Jacuzzi, who also happens to be the leader in hot tub innovation.The tub is made of white acrylic, is ADA-compliant and made only of Eco-friendly materials. Click here for more info and pricing on Amazon. Which Jacuzzi is the best? 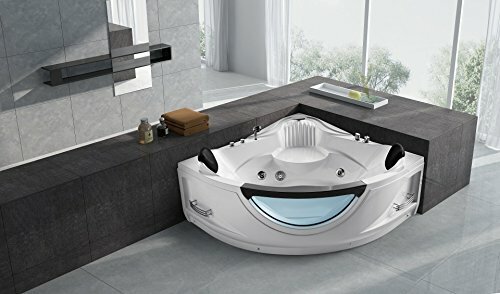 Each of the types of jacuzzis in our review has its unique features which could determine your choice: most tubs with multiple features sacrifice space to accommodate the added amenities to the tub. Others simply want the relaxing space, sans the frills, as after all, it is relaxation they are looking for. Still for others, the type of installation is a big thing as installation, if recessed not only adds to the cost: maintenance is another factor to consider. Whatever our reasons may be, one thing is for sure. That jacuzzis are here to stay for the benefits that it brings. The Jacuzzi is probably the item which is most often associated with SPA's and which offers the closest relaxation experience to a SPA. And having a Jacuzzi in your own bathroom or in your yard, next to the pool, can be something really enjoyable. But what do you do, if you live in a small apartment or a small house and you would still like to have the comfort that a large Jacuzzi filled with hot water can offer you? Probably the most obvious problem is that you have to fit a large, round-shaped or square-shaped Jacuzzi in a small bathroom, next to many other items. But no problem! With the latest evolutions in technology and design for insides, corner Jacuzzis have been projected by specialists in order to perfectly fit in any corner of your bathroom. The big advantage of corner Jacuzzi's is not only their great shape, neither the fact that they are very roomy, nor the excellent functions that they have incorporated, but the small space that they occupy and the large-bathroom impression that they offer. Another advantage of a corner Jacuzzi is that it can be either simply settled in the nook of your bathroom, or incorporated in larger bathroom corner cabinets or other furniture pieces. Also, the variety of colors and shapes of the Jacuzzi's that you will find on our website will allow you to beautifully match them with your bathroom's general theme. So start reading the details of what we selected for you on our website, take a look over the descriptions of 2 persons or single-Jacuzzi's with multiple vibrating or hydro-massage functions and see what best suits your vision and desires regarding your bathroom and your dream experience in a Jacuzzi! Gone were the days when a corner jacuzzi was considered a luxury: as the benefits of jacuzzis are being highlighted, more and more people have changed their attitudes towards this relatively “expensive” equipment. The jacuzzi has two basic features that bring about the benefits that its users experience. First, water jets out of the tank with a pressure that simulates that of a massage. Thus, tired muscles are soothed, freeing it from the aches and pains brought about by daily strenuous activities that the body does. Second, the water is heated so that the heat dilates blood vessels, promoting better circulation of the blood especially to the extremities so that joint pains are lessened. Corner jacuzzis bring the advantage of space as only one side of the equipment is provided space, the other sides taking advantage of being tucked away in the corners of the room. Its design takes away that awkward feeling of being “out of place” sitting in the middle of a room.